This was SJGR's second visit to this grand historic mansion in the Torresdale section of Philadelphia, PA along the banks of the Delaware River. See the results of our first investigation by clicking HERE. The physical evidence collected consisted of the above average amount of 30 EVPs and 73 positive photos with energy orb anomalies in them. 4.9% of positive photos obtained falls within the normal range, but some photos correspond to events investigators were experiencing at the time the photo was taken. Other anomalous recorded readings were one EMF and two motion sensor readings. 8:32pm - Investigator Juliano recorded this orb (looped 3x) in the 2nd floor art gallery. 9:22pm - Investigator S. Carroll took this photo in the Rathskeller after Investigator Pawlowski obtains positive photos near the staircase, Investigator Gandhi gets the impression of a male, and Investigator Smith reports feeling cold. 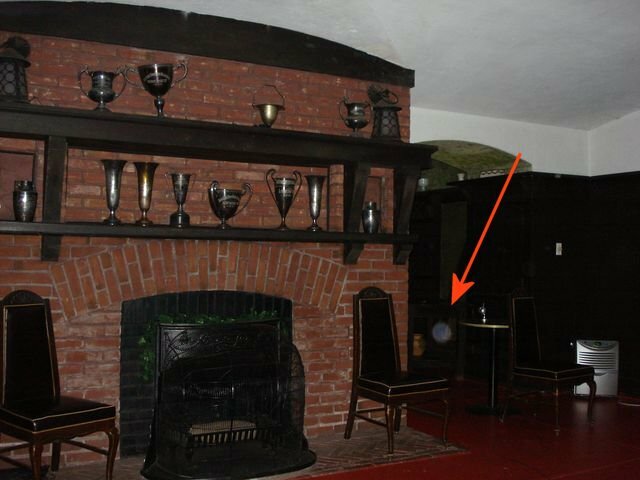 10:06pm – Investigator Bown took this photo in the Rathskeller after seeing a low shadow move in front of the fireplace. 10:36pm - Investigator Haines took this photo in the 3rd floor Servant's Staircase after feeling the presence of 2 spirits, both of which were very upset and rushing up and down the stairs; she had the impression there was an emergency on the third floor they were trying to handle. 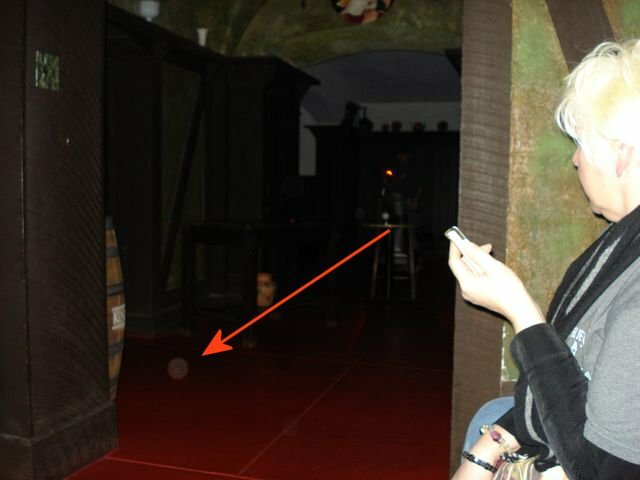 10:39pm – Investigator Bown took this photo in the Rathskeller after seeing a shadow exit the Bathroom and move down the hallway.